South East Tower01493 859640work Self-cateringThe medieval South East Tower in Great Yarmouth stands over 5 floors and includes two bedrooms and a spacious lounge. This historic property sleeps four with four others possible on airbeds and a single sofabed in the lounge. At the top of the building, a modern well equipped kitchen-diner has a picture window to the west. There is a balcony which offers unrivalled views over the town and sea st Great Yarmouth. A spacious lounge with large picture window and three arrow-slit windows is on the fourth floor. The master bedroom is on the third floor, opposite the main entrance with a large window and five genuine arrow-slit windows. Stairs lead down to a small landing with a door off to a twin bedroom, also with three arrow-slit windows. Stairs from the landing lead to the boot room and back door, with plenty of space for walking gear and beach paraphernalia. A further short flight of stairs leads down to the spacious cellar bathroom complete with covered fresh-water well, large bath and separate walk-in shower. The eclectic furniture throughout has been sourced mostly from auction houses. Interesting objects dotted about contribute to the character of the building. The tower illustrates some of Great Yarmouth's most important historical developments. The foundations of the structure date to the 14th century when the medieval wall was under construction, while the mid-section dates back to the 16th century when the town was in need of enhanced fortifications. Lastly, the top of the tower was added in the 19th century when it was first transformed into a residential dwelling. There is a parking space for 1 vehicle. We slept perfectly, and we didn't see any ghosts! As we moved our creature comforts into Great Yarmouth's medieval south-east tower for a weekend retreat with friends, neighbours told us the place is haunted. Grizzly stories emerged about a butcher found hanging inside the tower, and of a woman who fell to her death from the fifth-floor terrace. Whether you believe those stories or not, trust me when I tell you it was the most wonderful place to stay. Simply furnished and sensitively restored, the Great Yarmouth Preservation Trust has lovingly kept all the character of this 700-year-old defensive tower. It's last known occupant was a woman known as Paraffin Nell - you might guess she once sold lamp oil and other paraphernalia essential to life in the early 20th Century. But just being there, enjoying supper in the top-floor kitchen, was such a treat. The great thing about staying in the tower is that it's bang in the middle of where everything is happening. Five minutes east and you're on the sea front, but walk west and you're on the river and historic South Quay. Head north past the old merchants houses and The Rows on King Street, you're in town. A great place to stay. Well conserved and great decor. 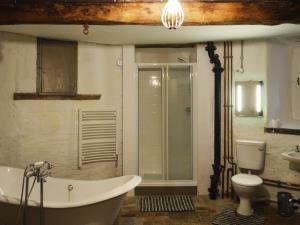 All mod-cons and a luxurious bathroom. Sub-basement bathroom which features a well with lighting to look down. The medieval South East Tower in Great Yarmouth stands over 5 floors and includes two bedrooms and a spacious lounge. This historic property sleeps four with four others possible on airbeds and a single sofabed in the lounge.